The new Bushnell 6500 series of riflescopes has been much anticipated. Today, Bushnell announced that its new 6500s, with 6.5x zoom range, will start shipping to vendors in March 2008. 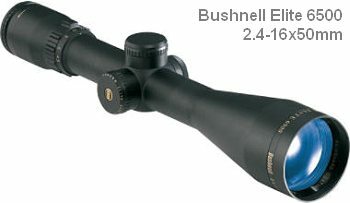 Bushnell claims the 6500 series delivers the highest resolution and widest field of view in its lineup of rifle scopes. Three models are offered: 2.5-16x42mm, 2.5-16x50mm and 4.5-30x50mm. All three models feature side parallax adjustment, 30mm main tubes, and multi-coated optics with RainGuard®. The 2.5x models can be adjusted from 10 yards to infinity while the 4.5x model adjusts from 25 yards to infinity. Suggested retail prices are: 2.5-16x42mm – $699; 2.5-16x50mm – $779; and 4.5-30x50mm – $899. Expect “street prices” to be about $75 – $100 less for each model, once sufficent supplies reach the marketplace. Our readers will probably be most interested in the 4.5-30X version. It has a 30mm main tube, 50mm objective, and weighs 21 ounces. The 4.5-30x offers 80-MOA of elevation and windage with 1/4-MOA clicks. Only two reticles are currently offered, a “Multi-X” fine-plex and a mil-dot. The new 6500 Elite 4.5-30x50mm competes head to head with Sightron’s new 6-30x56mm SIII scope. At SHOT Show we’ll get a look at both new optics and then post our impressions. For target shooters, the Sightron appears to have the edge–as it offers a larger front objective, and target turrets standard. CLICK HERE for more info on Bushnell 6500 Scopes. Share the post "Bushnell Rolls Out Elite 6500 Scopes"
Fifty-two competitors, many clad in historic military uniforms, shot period-correct rifles and pistols in the So. Michigan Gun Club’s 8th Annual CMP “Snow Shoot” Vintage Rifle Match. Cold, snowy weather on January 26th didn’t stop the diehard shooters from enjoying friendly competition and supporting the M1 for Vets Program, which provides M1 Garand Rifles to disabled American veterans of the Iraq and Afghanistan conflicts. Over $1000 dollars was raised for the M1 for Vets Program. The overall match winner was Caleb Hughes. Hughes shot a 289-3X with a K-31 Swiss 7.5×55 and received the First Place Trophy, a plaque and a gold Military CMP pin. The second place winner was Phil Randall who shot a 283-6X and received the Second Place Trophy, a plaque and a gold M1903 CMP pin. Alexandra Verburg was the top female shooter of the match. Competing in her very first Snow Shoot, Verburg shot an impressive 214-1X with an M1 Carbine to win the First Place Women’s Trophy. CLICK HERE to learn more about the Michigan Snow Shoot. Share the post "Snow-Shoot Competitors Help Disabled Vets"